I'd been looking for a Worthington HP130 for a while and had the chance to borrow and use one recently if I got the visual inspection done. Considering that cost the same as a rental and the fact that no shop in the Bay area had one for rent, I jumped at the chance. The deal was that I could use it a few times and then buy it if I liked it. The asking price was also pretty low considering the tank had been hydro'd this year. The extra gas would let me gas match a lot better with A and other dive buddies who had much better air consumption than I did. It also makes my rig 12lb heavier which isn't much but, in my head, works me up to doubles. The specs don't make it seem so but it is significantly larger than my HP100s. It was a freezing cold morning - sea_otter and I headed down with the truck's thermometer reading 39F but, luckily, it was sunny all day long. We did another skills dive at the Breakwater to start off. The surface was pretty rough and there were some pretty significant waves crashing on the beach. On top of that, there was practically a carpet of red pelagic crabs washed up on the beach which made for some crunchy entries and exits. It actually looked like a lot of them were swimming in to shore rather than being washed up - there were tons of them in the water too and the sea gulls were having an all-you-can-eat party. The skills dive went better than last time, I kept my eyes open during the mask skills which was a lot easier and the ascents were slightly more controlled. I'm still depending a lot on venting my wing to get stable and 20ft and above is not super comfortable yet. The swim back to shore was fun too as the crabs kept us company most of the way there. After a deeelish SI snack of spam musubi (which is now going to be my go-to dive food), we headed over to the Metridium Fields. We found the pipe and chugged forward pretty quick along it. There was less life on the pipe itself than what I'd heard of - maybe it comes alive at night (??). There was an enormous lingzilla inside the end of the pipe which I've heard is resident there. The viz had reduced a bit since the last dive but we found the Fields pretty easily. I wasn't expecting to have much gas left to explore there but, boy, does that 130 give you a lot more breathing room (yes, I know what I did there and am quite pleased with myself). It was cool to see all those metridiums but, honestly, I thought the fields were a lot bigger than what we saw. After reaching turn pressure, we headed back along the pipe until we got to about 25ft and it got super surgy. We managed one more round of drills before we ascended. sea_otter shot a bag which I promptly got myself entangled in and then proceeded to not distinguish myself on the ascent. 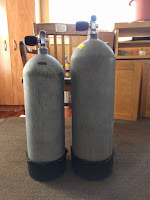 Fun dive overall and I love the HP130 - it feels almost identical to the HP100 in the water. I'm definitely going to keep it. Even after all that musubi, I was hungry enough to head to Hula's for a post dive meal. The drive back was more awful than usual and I slammed 2 RedBulls in anticipation of a late night watching Rogue One.